Detective Taylor Krauss told police he didn't recognize Colson, who responded in plain clothes to gunfire directed at the Landover police station in March. Colson's family is "disappointed" with the decision. UPPER MARLBORO, Md. — The Prince George’s County police officer who mistakenly shot undercover detective Jacai Colson during an ambush at a police station will not face charges, according to the county’s prosecutor. 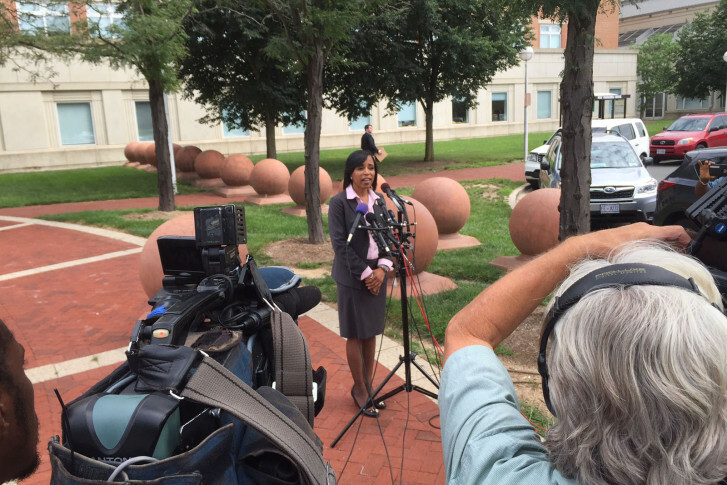 A Prince George’s County grand jury declined to return an indictment against detective Taylor Krauss, state’s attorney Angela Alsobrooks said. Earlier, police had said Krauss’s shot was the one that killed Colson, who had responded in plain clothes to gunfire directed at the Landover police station in March. Krauss told detectives he didn’t recognize Colson and perceived him to be a threat. In a news conference, Alsobrooks said the grand jury had access to evidence and heard from several witnesses to the shooting. “The grand jury was allowed to consider everything from first degree murder to misconduct in office,” Alsobrooks said. After hearing evidence over seven weeks, the grand jury reached its decision within the last several weeks. Alsobrooks said prosecutors wanted to speak and meet with Colson’s family before announcing Krauss would not face charges. “They are understandably disappointed,” she said. The grand jury heard that Colson was running backward and firing his weapon, when Krauss pulled his rifle’s trigger. Police said Krauss was the only officer with a rifle at the scene. Michael Ford, who police say opened fire on the police station during the ambush, will go on trial for Colson’s murder, along with brothers Malik and Elijah. The trial is tentatively set for October.